21/6/15 - In his latest posting, the blogger A Voice suspects that the NYT/WSJ/Bloomberg onslaught could be aimed at realizing a prophecy that Najib Razak would be forced to resign by the end of this month over a "confession" by Sirul (the rogue cop who killed Altantuya in cold blood, now residing in Australia) and a mysterious surat layang (poison pen letter) that would have impregnated the meaning of today's Happy Fathers' Day! Read more at Foreign Media Assault Phase? C'mon Pesek, get your facts right! 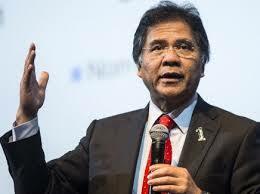 Idris Jala is a bluesman so you've probably never seen or heard him lose his cool. In his open letter to Bloomberg, however, the Minister in the PM's Department comes close to losing his head. And it's cool, really. I mean, it's cool to have a Malaysian Minister defend this country so passionately against such great economic experts who never had to run anything but thier columns, and they get sloppy even at that. You may read Idris' demolition solo at Please read my lips, I'm not going to repeat it again! Look like every day our ministers lose their cool. Guess the heats is to much to take. and after spending like rm7 billion plus on con sultants, this is what we get? no wonder idris jala is on the ledge. he is one of those that will kiss foreign medias for good news, and he is part of that con sultant scheme of things. didn't he get the award as one of the most powerful asian recently? Fitch is on the midst of downgrading our rating, what happen next after NYT, WSJ and Bloomberg report. who to blame, Mahadey? Anwar? Soros? the Jews? Chinesse towkay? who? so much of a PR go bust. one thing after another. might need another rm7 billion to spend i guess. that's how "the cash is king" guy works don't you think? 4. The doings of 1MDB-if 1MDB bough gov land at such a low price and later sells at market price,which is way higher, then there is surplus cash which can be used to offset GST or petrol prices. But despite this,there is still deficit of cash that the gov had to force the rakyat to pay. "The facts, however, are these. Between 2009 and 2014, Malaysian Gross National Income grew by 47.7 percent ..."
Facts and figures by themselves mean nothing. What is the comparable figures for our peers - Taiwan, South Korea or even Vietnam. Not to mention Singapore or China. To quote the man, let me repeat again (... and one more time! ), facts and figures must be put in proper perspective! Oops! I forgot that our peers are now Nigeria, Pakistan, and Afghanistan in which case Jala's figures are indeed impressive. Yes, our growth rate is higher than Japan, Western Europe and other advanced countries but those countries are already there, cruising at high altitude. Malaysia is still trying to take off and ascending. It cannot afford a low growth rate without risking a stall. As for our devalued ringgit, Jala seems impressed by Zeti's confidence rather than what the market is telling us. It is pathetic that Jala would consider his invitation to Harvard as an endorsement of the government's policies. Jala should instead visit our universities and schools and discover how pathetic they are. More important than what Jala tells those Harvard folks or how honored he was to be invited, what did Jala learn when he visited Boston and what lessons can he impart onto our local institutions. Or was Jala, like so many ministers on their "study" visits abroad impressed only with the glitz and ceremonies? Now , this is a real knuckles to Ultrakiasu DAPig , OSTB and AKJ . What else do you expect a minister to utter about his own government ? Therefore how much credit can you expect from what he said ? I have never ever believed anything or any promises seriously make by a politician, that is why they are called politicians. Take for example, Najib, promises, before the last GE, to build in Malaysia one million affordable houses if he won the elections. How many affordable houses has he built to date, two years after the GE ? Or how many of them has he planned to build ? The above is only ONE typical example of the kind of promise made by a politician. I can go on and on but the one thin the politicians all have regardless who they are or which political party they belong to. They all have rhino thick shim when it comes to keeping their promises and one thing they have in common is a life full of lies and deceits. On top of that Najib is also a promiscuous and a bloody imperious one, he has at his disposal a private jet to take him around wherever he goes. He spends more time jetting around the world than time in Malaysia. If only he spends just a little more time to ensure that his promises to the people he made before the election are fulfilled he would be deemed to be a truly dedicated politician. I am making it my immediate mission before the next GE to remind the voters of his empty promise to build the one million affordable houses before the 13th GE. This is not to mention the other empty promises he made before the last election. Open letter season by Ministers. Replacing old Kad Raya greeting which already out practice with the advent of social media. "this is a real knuckles"
x fasih dlm bhsa omputih, jangan cuba la pantat. TDM suruh NYT dan Blomberg kutuk Malaysia? Tu nak bising supaya bolih bertanding jd MP.